Summer is fun, but the 90 degree heat isn’t. One of the best ways to cool down is with a tasty treat like ice cream. Dealing with heat and humidity isn’t as frustrating if you have a delicious cone in your hand. If you’re from Pittsburgh and haven’t been to these ice cream places, you’re doing yourself a disservice. Finish your summer off by visiting some of these sweet shops. NatuRoll doesn’t serve up your average ice cream cone. It’s Pittsburgh’s original rolled ice cream shop in Lawrenceville. They spread their batter onto an ice pan, mix in toppings and then scrape the ice cream into rolls. You can watch them work their magic from behind the glass counter while you wait for your concoction to be made. They have a variety of flavor combinations, but you can also make your own. Vegan and dairy free options are offered as well. Aside from its flavor, the design has captured a lot of people’s attention. This hot new trend of rolled ice cream has been taking social media by storm. For all of you millennials out there, these interesting bowls make for a perfect Snapchat or Instagram story. Millie’s is a cute little shop located in Shadyside and now have a second location in Market Square. It is very pink, quaint and adorable. As soon as you walk in, you are embraced by a cinnamon aroma from their homemade waffle cones. You instantly feel warm and fuzzy inside. 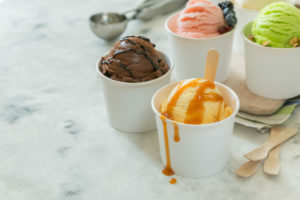 Twelve different flavors of smooth and delicious ice cream are offered. Can’t get to Shadyside or Market Square? You can also buy their products in grocery stores and select restaurants around the city. 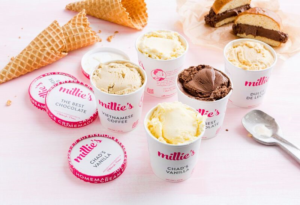 For even greater convenience, you can have Millie’s Homemade Ice Cream delivered to your door! What more could you ask for? Klavon’s Ice Cream Parlor is a Pittsburgh tradition located in the Strip District. Walking through their doors, you’re instantly transported to the past with their marble countertops, steel fountain equipment, revolving stools and wooden phone booths that are the same from when they first opened in 1923. If you take a closer look, you can actually see a mark above the phone booths that shows how high floodwaters reached in 1936. You can feel the history as you sit and gaze upon the parlor filled with antiques and old photographs. Klavon’s is even featured in the children’s historical fiction novel Macaroni Boy by Katherine Ayres about a young boy living in Pittsburgh during the Great Depression. Their sundaes, floats and sodas have been loved by many since the 20’s. The famous Penn State Ice Cream is imported straight from the creamery into their parlor to serve as well. Klavon’s also has a food menu if you want something to go along with your dessert! In South Side on E. Carson Street, Page Dairy Mart is one of the best ice cream shops since 1951. They were named as the Pennsylvania State Winner for Ice Cream Shops by the Fan’s Choice Awards in 2016. It is an outside shop with no seating, so you have to order and go. Their famous gooey and creamy Hot Chocolate Chip Cookie Sundae is popular among customers. Since 1983, Dave & Andy’s in Oakland has been scooping over 200 flavors of ice cream. Along with their homemade ice cream, they also hand roll their fresh waffle cones. They are a quaint little parlor with yellow walls, fun murals and small two-person tables. While you wait to order, you can browse their various flavors of the day by perusing the big chalkboard behind the counter. Chocolate chip cookie dough and birthday cake are their most popular flavors. Make sure when you go that you have some cash handy because they don’t accept debit or credit cards. 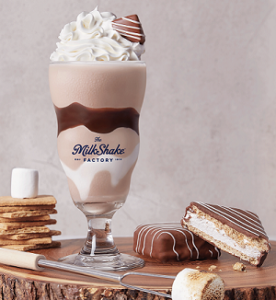 Located in Downtown Pittsburgh and South Side, the Milkshake Factory serves milkshakes, sundaes, chocolates, sodas and drinks with dairy free and vegan options as well. They’re known for their gourmet milkshakes featuring 12 different flavors. The shops have a chic, white marble design with plenty of seating and bright lighting. It started out as a small soda fountain and chocolate shop in Lawrenceville in 1914. Based on their size and design, you’d think that they’re a larger company, when they are actually just a local Pittsburgh shop. Fudge Farm in South Side is best known for their fancy milkshakes and fudge. Their milkshakes are piled high with delicious toppings and treats that people love to both drink and take pictures of. They have 15 milkshake flavors all named after places and people in Pittsburgh. You can even order fudge and chocolates online with free shipping if you don’t have time to visit. Their shop is medium sized with high top tables and cute rope swings by the entrance. You can swing and people-watch on Carson Street through the large glass windows while sipping your milkshake. They also do retail, wholesale, fundraising and special events. Cool off with some sweet treats at these fun and famous ice cream shops. Pittsburgh is known for its inconsistent weather, so when it’s sweltering hot this summer out go grab a cone. Here at STORExpress, we have a fair share of ice cream lovers. One of our top favorite ice cream shops is Klavon’s because it preserves its tradition of the past. At STORExpress, we do something similar by saving old buildings such as bowling alleys or schools and turn them into storage facilities. Comment below and tell us what your favorite ice cream shop is and why! There are plenty of places with a variety flavors for you to choose from so go ahead and start eating!